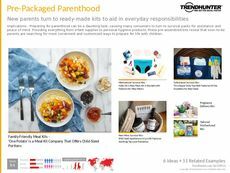 Find Better Ideas, Faster ® with a custom baby clothing trend report, our PRO Dashboard and 80+ categories of premium trend reports. 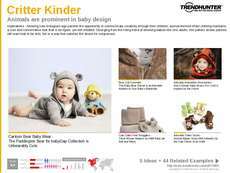 The Baby Clothing Trend Report explores expressive infant apparel, infant couture and artisanal kids fashion. Driven by parents' desire for self expression, the infant wardrobe has evolved to feature satirical messages, artful patterns and even luxe details that elevate pint-sized clothes to new heights. When examining this research, readers will learn about how adult runway looks are re-shaping contemporary baby clothing and transforming it from juvenile to sophisticated. This report targets baby brands, clothing manufacturers and millennial parents. 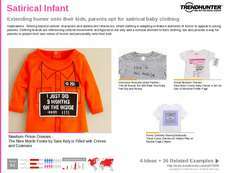 In addition to its clothing-specific focus, this collection of research also highlights emerging retail trends in the e-commerce sector and also illustrates how pint-sized social media stars are influencing the baby clothing industry as a whole. Highlighting topics like infant couture, retro tot and artisanal infant, the Baby Clothing Trend Report examines how social media, e-commerce and parents are influencing the future of children's fashion . Moreover, the research dives into the style icons that are behind this marketing shift and explores emerging innovations in the world of connected kids gear.